We were very sad to learn of the passing of John Walker on 7 May 2011. As founder member of the Walker Brothers he made some magical recordings that will always be remembered and his music will live on. His fans were worldwide and he always made the time to acknowledge his many supporters at every opportunity. He had many friends and admirers and will be greatly missed. As previously reported John took part in the recording of a programme titled "Hit Giganten" when he was in Berlin last year. A number of other artistes also participated including The Animals - "House of the Rising Sun", The Flowerpot Men - "Let's go to San Francisco", The 5th Dimension - "Let the sunshine in", The Easybeats - "Friday on my Mind" and The Fortunes - "Freedom come, freedom go". Rod Allen, lead singer and founder member of The Fortunes, very sadly passed away earlier this year and this was one of his last appearances. John performs a newly recorded version of The Walker Brothers number one hit recording of "The sun ain't gonna shine anymore", with his wife Cynthia on backing vocals. We are now pleased to announce that this programme will be broadcast on Friday 16 May 2008 on National Channel Sat1 at 20:15 PM. John has written a number of songs with a 'country' feel to them and at the moment he is busy fine tuning them in his recording studio out in California. Like John you can take part in this survey to find the 1111 most popular and favorite songs of all time. For John's Top Ten click here. is available at the 'live' shows. For full details please click here. Extra tour date added. For full details please click here. New Radio and TV interviews. Eddie Mooney of The Dakotas will be featuring The Walker Brothers on his ALL FM radio show on Monday October 29th from 9pm - 11pm (GMT). You can listen on 96.9FM or online. November/December tour in the UK. Now that the 2007 Silver Sixties tour is over and we have had some time to rest and enjoy our stay with our friends Lothar and Uschi in Germany, I wanted to take this opportunity to personally thank all of you who came to see me on the tour this year. It is always a great pleasure for me to see my old friends and fans again and a wonderful surprise to meet so many new ones as well. I was also happy that not only did you enjoy the Walker Brother songs, but so many of you enjoyed the new songs from the Just For You CD ! As you may know I am going to be appearing in some special concerts in June in Leamington Spa, Cannock, and Bromsgrove. I am looking forward to working with the Dakotas again and we will be performing some songs that I have recorded during my early solo career, some songs that I just enjoy singing and playing, and of course the old favorites. I am also looking forward to performing in a more intimate atmosphere. This will be something new, and I think an enjoyable experience for all of us. (for details click here.) and will begin work on a new special project, which we will tell you more about later! headlining his own show. The special guests on this exclusive tour are the Dakotas who are without doubt one of the finest touring bands performing today. For tour dates please click here. From the 1st May for four weeks, John and Cynthia will be taking a well earned holiday in Germany; whilst in Germany John meet up with 'Phallus Dei'. They have been working together on a soundtrack for a soon to be released German movie called 'Sommertag'. "Let's make our way to Swabia, there is plenty of good stuff to be had!" John's new CD 'Just For You' is ready now. The official release date is 30th April. You can place your order on the website Shop from 10th April. In the meantime you can only buy the CD at 'Live' shows like the Solid Silver 60s tour where you will have the chance to get it signed by John. For more information regarding the cover, tracklist, soundclips, etc. click here. John is doing a number of interviews to promote the Solid Silver 60s Tour 2007 and his new CD 'Just For You'. For full details please click here. 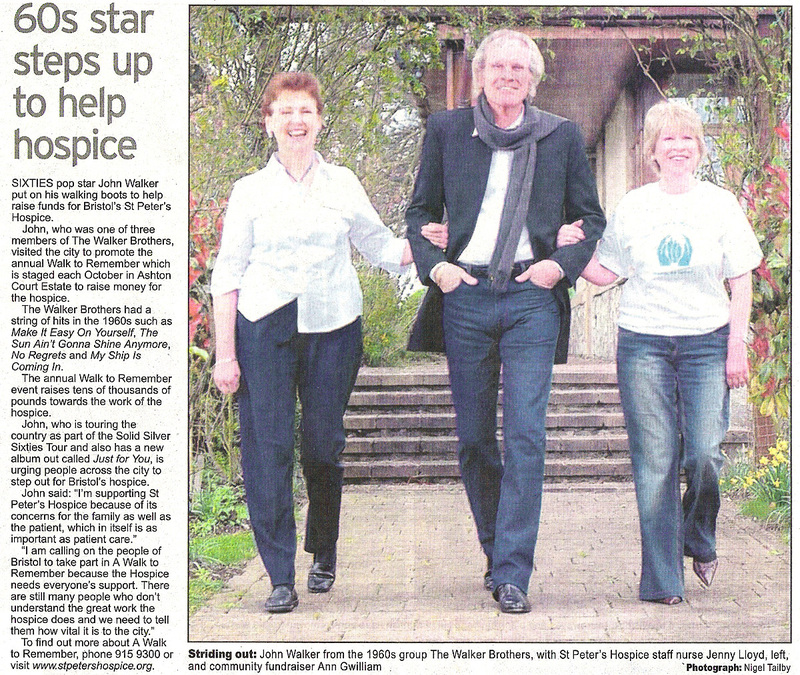 "Sixties pop star John Walker put on his walking boots to help raise funds for Bristol's St. Peter's Hospice"